Selling your brand to consumers is not a bad idea, it’s actually wise if you want to be known for who you are and remain at the top in your industry. By selling your brand we’re not advising you to list it on the market or put a price tag on yourself, but sell who you are and what you represent to your target audience. The connection you will make with consumers will be far more than if you sat still and held back on information or value others might see in your brand. So begin today and sell your brand, but don’t sell out using our four ideas to maintain that reputation and hold true to your company and self-beliefs. Several successful entrepreneurs underestimate this technique, but selling is what will get your brand out there and recognized. Let’s straighten things out by first explaining the difference between selling your brand and selling out. Selling your brand means to strategically market your talent and showcase who you are and what you stand for as a company or organization. Selling out means you are trading your true self and beliefs, like your mission statement, for a gain (money, reputation). By not selling your brand you are closing off several consumers that know nothing about you, leaving word-of-mouth as your lead advertisement. With that rate, hopefully your brand will be heard on local radio stations by the year 2034. Avoid waiting another twenty years for your brand to be known, instead use the following marketing tips to sell your brand today. Keep in mind your personal mission statement. 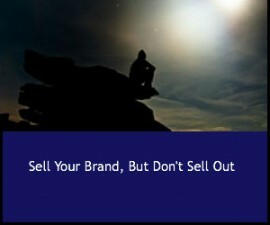 As long as you stick to these words, your name and brand will stay true and you won’t sell out. We have provided four ways to ensure that sell out will not happen. 1. Every week keep a report of what you do. Write down everything good the company has accomplished or achieved throughout the week. Even the smallest actions can go the furthest when it comes to connecting with consumers. Include the picture of you and your staff visiting a pumpkin patch or share a positive experience you encountered with a customer this week. Those connections are what consumers can relate with and draw them in to become a dedicated and life-long customer. 2. Go into the public eye. Get your brand out there, inform the world who you are and what you stand for by sharing information on social media platforms (like Facebook, Twitter, YouTube, Tumblr, etc.). Be one of the top in your industry by again, connecting with your audience. Build your profile to highlight your success and ongoing developments to consumers, listeners and fans. Join organizations around your community. Go to the committee meetings, public hearings, become a member on the non-profit board or visit your local Chamber of Commerce. See how you can speak at these clubs and events around the community so your name, and business, is familiar and well-known to the locals. If you want to on top, then you’ll have to take the necessary risks others are too afraid to make. According to Inc., “Those who do stupid things without first getting permission can get fired. However, people who achieve brilliant things without getting permission get praised.” That doesn’t mean you have all rights to go out and do what you want, but rather to go out and be loud, stand tall and sell your dream, not beliefs. The next time you’re contemplating an advertisement or marking plan, remember these four tips to sell your brand, but don’t sell out or you could jeopardize all you worked hard for and dreamed to achieve.